Korea wants to develop the planned food industry cluster in the southwestern region into a role model of the “creative economy,” a concept promoted by President Park Geun-hye to generate new business opportunities through the integration of different industries. Extensive research and development (R&D) facilities will open in the Korea National Food Cluster, named Foodpolis, by June 2016 when nearly 150 food companies from home and abroad begin producing a wide range of value-added, processed products. Foodpolis will operate three main state-of-the-art R&D centers, each dedicated to ensuring food safety, quality and packaging, to help companies improve their existing products or developing new ones. The government plans to create a “halal food complex” inside Foodpolis, attracting companies looking to export high-quality halal food items to the Middle East and Southeast Asia. The cluster, which will serve as a strategic base for multinational food firms looking to enter China, Japan and other Asian nations, will play a role as a R&D hub for Korea’s food industry, according to Lee Dong-phil, minister of agriculture, food and rural affairs. The ministry has and will invest a total of $500 million to build the food industry complex on a 2.32 square kilometer site in Iksan, North Jeolla Province. When completed by 2016, Foodpolis is expected to churn out $14 billion in output annually and generate 22,000 new jobs as over 150 companies and 10 research centers will operate there. In order to make the cluster more R&D-oriented, the ministry will open three major research facilities in June 2016: the Food Functionality Assessment Center, the Food Quality Safety Center and the Food Packaging Center. Foodpolis will place top priority on developing 20 “star” products by 2020 in a bid to help companies introduce new food items, according to the ministry. It plans to use advanced biotechnologies to produce highly-functional food items and commercialize Korea’s traditional food. The government will make more efforts to transfer the state-run R&D institutes’ knowhow and expertise to food companies, Lee said, stressing that he will do everything to help food firms utilize research knowhow to make new products. Among other ingredients, researchers are expected to primarily deal with ginseng, kimchi, fruits, vegetables, herbs and rice to make healthy food items. The Netherlands, Denmark and other advanced countries, which operate a large-scale food cluster, have been developing hundreds of health-boosting food items, according to the minister, who said R&D centers in the food cluster should mobilize its resources to develop innovative products in cooperation with private firms. He then said the research centers will cooperate with their foreign counterparts and implement joint projects. “We should learn from advanced countries in order to become one of global powerhouses in the field of functional foods by 2025. Our researchers should be given a chance to work with their counterparts at foreign research centers and learn their knowhow,” the minister said. Lee said Foodpolis will increase cooperation with universities and other state-run facilities nearby to create a large-scale food science belt in North Jeolla Province. 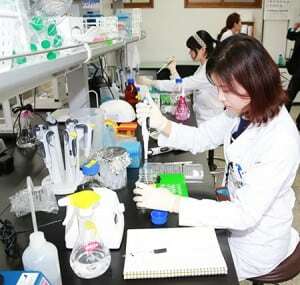 Rural Development Administration (RDA), the state-run agricultural research institute, has relocated to the nearby city of Jeonju. Saemangeum reclamation zone built along the coast of North Jeolla Province is being turned into an agricultural and industrial complex. “On top of RDA and the Saemangeum zone, we have the Daedeok Science Complex just north of Foodpolis. So, if we build a food science belt linking Foodpolis with the three, we can build a mega food industry hub like Food Valley in the Netherlands,” Lee said.